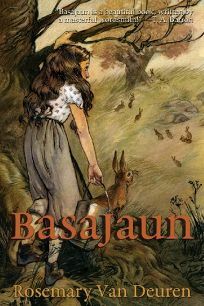 In this entertaining pastoral fantasy, Van Deuren invokes Redwall, Watership Down, and Beatrix Potter as she spins a magical tale of defiance and desperation in the English countryside of 1906. When Pastor Harding comes to a small town to deal with the local rabbit population, only 12-year-old Cora and her milkman father are wary of the man and sympathetic to the rabbits. Soon after, Cora is given a magical amulet that allows her to communicate with the animals. Making friends with the rabbit Basajuan, she becomes instrumental in the creatures’ struggle for survival. As Cora confronts Pastor Harding, she faces magic, mystery, and tragedy, and must decide whether she stands with humanity or the rabbits. Although the message gets a little heavy-handed at times, there’s a charm and underlying sweetness to the story that balance out disturbing imagery of the slaughter of rabbits and adults terrorizing children. The story takes some unexpected turns involving the use of transformational magic and wish fulfillment, leading to a slightly muddled, but nonetheless satisfying ending. Ages 12–up.